21 August 2018: There’s a palpable buzz at the Instaclustr offices. The Canberra-based tech growth company is the home of a platform delivering holistic, one-stop hosted and managed big data tech solutions. Here, discussions fly fast and fizz with laidback energy. The whole space is charged with ideas. It’s all in keeping with Instaclustr’s creative, innovative nature – nurtured by its chosen stomping ground at the University of Canberra’s Bruce campus. 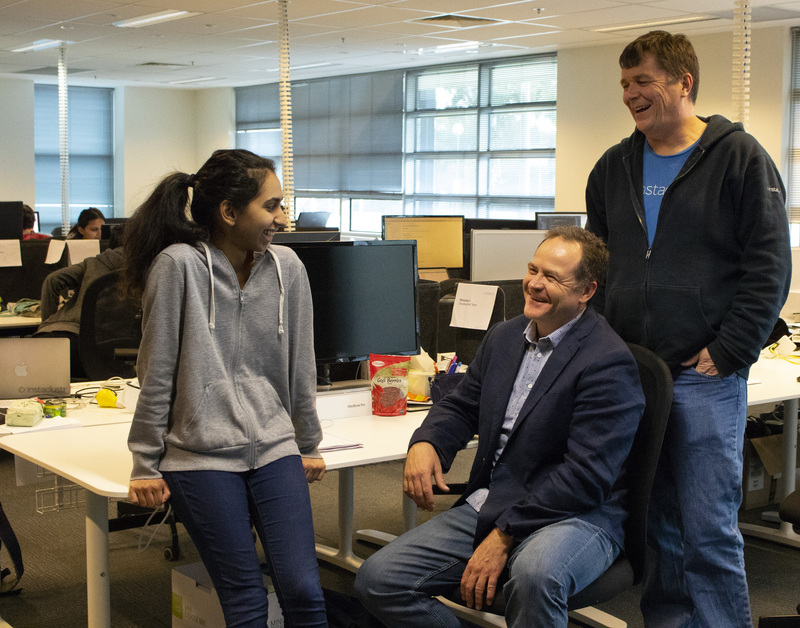 Second-year Bachelor of Accounting student Shivani Sehgal (left) has been working with Instaclustr's Chief Marketing Officer Doug Stuart (seated) and Chief Operating Officer Peter Lilley, since her first semester at UC. “There’s a great culture here and the campus vibe keeps everything young and fresh,” Instaclustr’s Chief Marketing Officer Doug Stuart said. “The university is very young, dynamic and entrepreneurial, open to new ideas – and that’s in line with what our business is all about. The ideal location has allowed Instaclustr to draw on the University’s talent pool. Undergraduate students and graduates benefit from internships, learning opportunities and full-time employment with the company. “We’ve got about six UC alumni working with us right now and usually up to four interns on a rotating basis,” Chief Operating Officer Peter Lilley said. “That’s about 15 per cent of our workforce. Second year Bachelor of Accounting student Shivani Sehgal has been working at Instaclustr since her first semester. Last week, Instaclustr announced it had raised $20.8 million in a funding round led by New York-based investment firm Level Equity. The funding injection will accelerate the already impressive global expansion of a firm named as one of Australia’s fastest-growing tech start-ups, according to the Australian Financial Review’s Fast Starters 2017 list. Level Equity has joined a stable of existing investors, including Bailador Technology Investments, ANU Connect Ventures and Our Innovation Fund, LP. “Between now and 2019, we’ll grow from 65 staff – 45 technical staff – to having 100 developers and full stack engineers, most of whom will be based right here at our UC headquarters. Plus 10 to 15 more on the marketing side,” Mr Lilley said. Instaclustr has over 100 customers globally, serviced from the Canberra headquarters. Part of Instaclustr’s success has relied on its formidable data capabilities, which allow it to scale as rapidly and reliably as needed. Co-founders Ben Bromhead and Adam Zegelin, both of whom are now driving the company’s expansion in the United States, came up with the concept in 2013. In 2014, Mr Stuart and Mr Lilly came aboard as angel investors and co-founders. The start-up began life in what is now the co-working space Entry 29@UC, but quickly outgrew it and moved to its own space at the University in 2016.